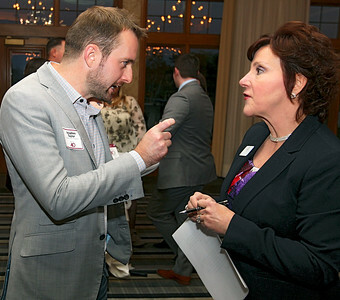 H. Rick Bamman - hbamman@shawmedia.com Northwest Herald's Best Under 40 award honoree Stephen Taylor, Technology Consultant and CEO at LeadingIT, and program sponsor Kathleen Caldwell talk during the reception on Wednesday, Oct. 18, 2017 at the Boulder Ridge Golf Club in Lake in the Hills. H. Rick Bamman - hbamman@shawmedia.com Membership development manager for the Crystal Lake Chamber of Commerce and Best Under 40 award honoree Deidre Martinez hugs nephew Collin Eichinger at the Northwest Herald's Best Under 40 award program on Wednesday, Oct. 18, 2017 at the Boulder Ridge Golf Club in Lake in the Hills. H. Rick Bamman - hbamman@shawmedia.com Caleb Jett plays with his brother Greyson Jett during the Northwest Herald's Best Under 40 award program on Wednesday, Oct. 18, 2017 at the Boulder Ridge Golf Club in Lake in the Hills. The boy's father, Wayne Jett was one of the honorees at the event. 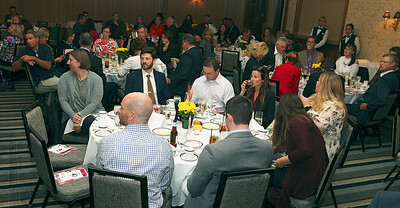 H. Rick Bamman - hbamman@shawmedia.com Guests and honorees attend the Northwest Herald's Best Under 40 award program on Wednesday, Oct. 18, 2017 at the Boulder Ridge Golf Club in Lake in the Hills. 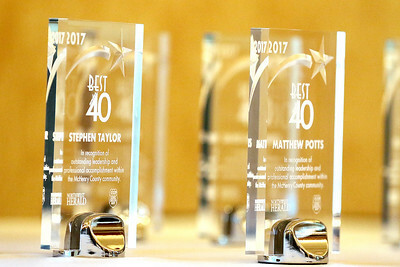 H. Rick Bamman - hbamman@shawmedia.com Northwest Herald's Best Under 40 awards await presentation on Wednesday, Oct. 18, 2017 at the Boulder Ridge Golf Club in Lake in the Hills. H. Rick Bamman - hbamman@shawmedia.com Shaw Media's group marketing and events director Meredith Schaefer greets guests at the Northwest Herald's Best Under 40 award program on Wednesday, Oct. 18, 2017 at the Boulder Ridge Golf Club in Lake in the Hills. Membership development manager for the Crystal Lake Chamber of Commerce and Best Under 40 award honoree Deidre Martinez hugs nephew Collin Eichinger at the Northwest Herald's Best Under 40 award program on Wednesday, Oct. 18, 2017 at the Boulder Ridge Golf Club in Lake in the Hills.